Tech companies aren’t perfect. Far from it. They make their share of mistakes, and the Business Insider Web site has gone to the trouble to prove it. 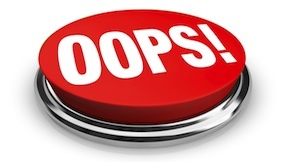 The site recently ran its list of the biggest consumer technology mistakes of 2013. When Google launched a barge in the San Francisco Bay, it started a round of speculation. Just what was Google up to? As Business Insider says, first people thought the barge might be a floating data center. Others thought it might be a unique storefront to sell Google Glass. No one knows yet what it might be. But Google definitely messed up. As Business Insider reports, the company failed to obtain the proper permits for the barge. The floating disaster is now under investigation. Apple is still a technology leader. But it also makes mistakes. One of them might be its line of iPhone 5C smartphones. These brightly colored phones haven’t caught on with the public, even with the phones’ lower prices. Business Insider reports that Apple might be cutting 5C production in order to manufacture more of the higher-end iPhone 5S models. Know what Aereo is? It’s actually an interesting new way to watch TV. The service transmits broadcast channels to your tablet and phone. As Business Insider reports, TV companies aren’t happy about it. They’ve attacked Aereo with lawsuits. The problem? It isn’t working. As Business Insider says, the attacks have done little but bring attention to Aereo.